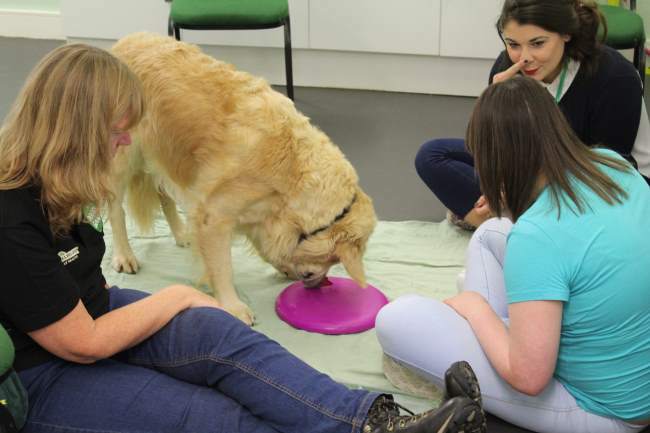 Our Community Dogs work in a wide range of community settings including with adults with autism, children with brain injury, in special educational needs schools and older people. helping people to increase confidence in public places. So what makes a Community Dog different from an Assistance Dog? Unlike their assistance dog cousins whose skills and temperament are matched to help one partner, our community dogs work alongside a specialist handler and sometimes with a health or education professional to help the people they’re supporting to develop skills and work towards specific goals. The sessions are usually weekly, and continue for a number of weeks/months, depending on the needs of the person. Once the sessions are finished, the hope is that the person not only achieves their goals but is able to maintain them independently without reliance on the dog. So it will come as no great surprise to learn that the life of a community dog can be extremely varied. First and foremost our community dogs are super-friendly dogs. Our community dog team look for dogs that really love interacting with people and want to get to know everyone. They need to be relaxed and confident in any environment – community dogs will regularly work in hospitals, schools, shops and noisy roads to name just a few – in addition we’re looking for a dog to be patient, gentle, adaptable, with great self-control and focus and ability to settle quickly. All of these traits enable the dog to work with different people in multiple situations and environments where there are lots of distractions. The dog may need to quickly switch from being active and playful to being physically calm, depending on the circumstances. Our small team of dogs and handlers have already supported people to develop a range of skills, including managing anger/frustration; improved communication and speech; taking responsibility to care for others; overcoming fear and anxiety and developing confidence to go out and engage with others in the community. With more dogs joining the Community Dog team we hope to expand this even further and are excited by what we may be able to achieve.